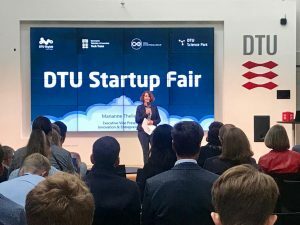 A thousand tech-interested attendees participated in DTU Startup Fair that took place 10th of October during High Tech Summit 2018. Entrepreneurs, researchers, investors, students, mentors and many more came together to connect with the entrepreneurship ecosystem at DTU. 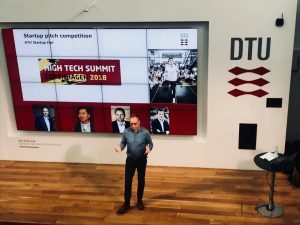 A recent impact analysis made by IRIS Group shows that DTU has created a special ecosystem that creates more than two startups per week, proving one of the reasons why DTU now ranks the 57th on Reuters Top 100: The World’s Most Innovative Universities – 2018, and number 1 in the Nordic countries and number 13 in Europe. The main library at DTU was transformed into a buzzing tech fair where 43 startups showcased their products with a wide span from health tech, robotics, drones, food tech, sensors, internet of things, agriculture, artificial intelligence, energy, lasers, traffic safety, augmented reality to gender equality. The four organizing partners were DTU Skylab, DTU Tech Trans, DTU Science Park and Open Entrepreneurship. 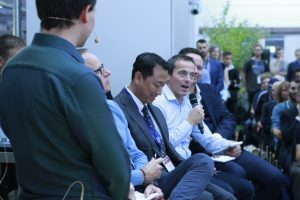 All partners came together to display the high quality startups that solve relevant problems with world leading technologies and research, and to invite everybody closer to the university in order to create and capture more knowledge and value to the society. Get the DTU Startup Fair booklet and read more about the startups and organizing partners. 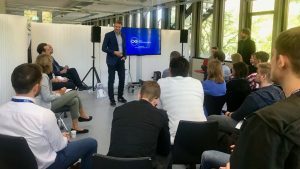 Around 50 attendees took part in the morning backstage session where the four organizing partners, DTU Skylab, DTU Tech Trans, DTU Science Park, Open Entrepreneurship and the DTU Course, HardTech Entrepreneurship presented how to get involved in the many entrepreneurship activities. The invitation was extended by Jes Broeng, Professor in Entrepreneurship and founder of Open Entrepreneurship: “Open Entrepreneurship is an invitation to all. We welcome you inside the labs, so we together can build an open ecosystem where universities, industry and entrepreneurs collaborate.” These thoughts will be carried on by the new strategic initiative from DTU, DTU Entrepreneurship – a center for entrepreneurship where Jes Broeng will be the director. Read more about DTU Entrepreneurship here. Thomas Klem Andersen from DTU Science Park also addressed some of the challenges from the industry: “It can be harder for smaller companies, SMEs, to connect with DTU. At DTU Science Park they are trying to accommodate this through the program Smart Innovation. We help companies get access to DTU, identifying development projects, and match researchers and DTU staff with the companies to define the new products together.” Read more about Smart Innovation here. CEO and founder of Milestones Systems, Lars Thinggard gave a keynote before the pitch competition began. His message to audience was clear: “Optimize for life”. Thinggaard explained how this principle is guiding him and Milestone Systems, and they are using a method that consists of ratings of themselves and their colleagues and then having a follow up conversation; “We help each other to make sure that nobody is falling off the chair. We look at our intentions, behaviors and the conversation helps us to see our own blind spots,” said Thinggaard. Thinggaard recommended all students to start a company right after college to get all the experience and learnings that the startup journey provides. Seven startups were pre-selected out of the 43 attending startups to pitch in front of the audience and the four judges. 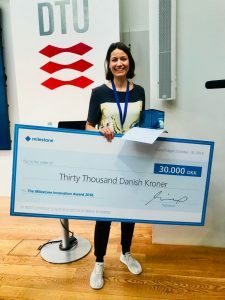 The winner would get the prize of 30.000 DKK and an exclusive mentor package sponsored by Milestone Systems. The seven startups competing for this prize were Obital, OptoCeutics, TresActio, Nordetect, Brain Capture, MattAR and MeasureLet. 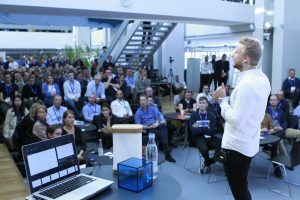 Some are student startups, some are research-based startups connected with experienced experts and some are external companies taking part in the Danish Tech Challenge hosted by Futurebox and DTU Science Park. The panel of judges consisted of some entrepreneurship-heavyweights from left to right: Moderator Jens Friholm (DTU), Lars Thinggaard (CEO at Milestone Systems), Ken Singer (Managing Director at SCET, UC Berkeley), Tore Duvold (Vice President at Innovationsfonden), and Sune Stilling (Head of Growth at Maersk Growth). MeasureLet is a technological toilet, that can measure patients’ urin and feaces and transfer the data directly to the patient file. It can increase efficiency in hospitals, as well as improve the patient and nurse experience. The company is founded by Marie Lommer Bagger and Louise Bangsgaard who both are educated nurses, and both worked at Rigshospitalet before starting up their company. On a daily basis, Marie Bagger and her company MeasureLet is a part of Danish Tech Challenge (DTC) hosted at Futurebox. According to Bagger it is “stressful, but very useful” to be a part of DTC. In addition, Bagger would very much recommend other startups to take part in both DTC and DTU Startup Fair next year. 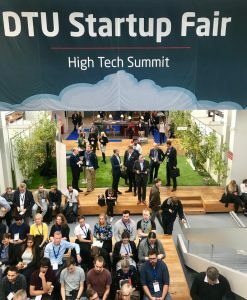 Get in touch with the thriving and unique ecosystem by contacting one of the organizing partners behind DTU Startup Fair at High Tech Summit 2018.